I can't believe it's already November- and what better way to start the month than with another fun giveawa. Sadly this one is just for US residents- it's okay if you know someone here that could get the prize for you. This time the giveawayis with Little Black Bag, a website where you can shop, trade and interact with other fashionistas. When you sign up, you get to choose a bag and then the LBB stylists choose 1-3 extra items for you- if you don't like them, you can trade them with other users! 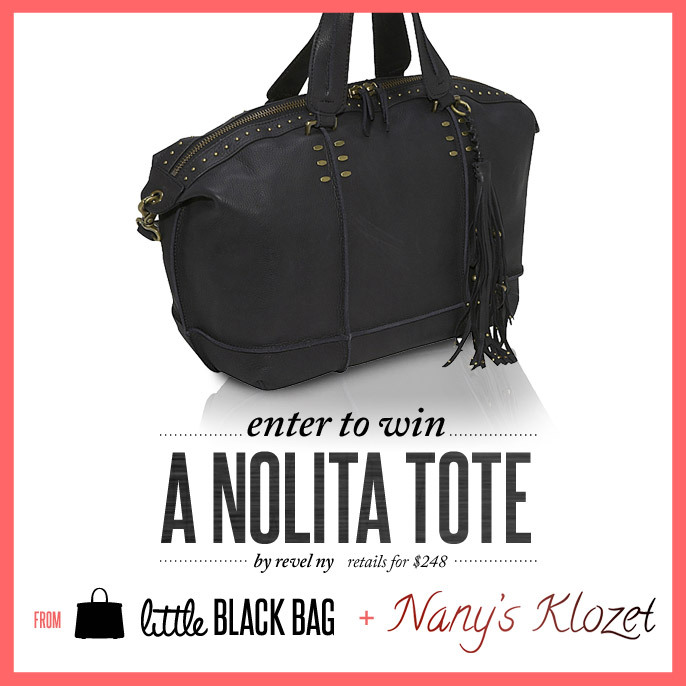 The prize: The Nolita Tote- which retails for $248!! How to enter? CLICK HERE! I also wanted to tell you about a cool promo they have starting TODAY, November 1st- with your order, you get 1 of 11 premium sample from Pureology.. and they are tradable too Samples include: radiance amplifying anti-frizz spray, maximum hold hairspray, hydrating shampoo or conditioner, etc. No puedo creer que ya estamos en noviembre- y que mejor manera de empezar el mes que con OTRA rifa que lamentablemente es solo para las que residen en Estados Unidos (si tienes algún familiar/amigo aquí al que pueda mandarse el premio si ganas... bienvenida también). Esta vez la rifa es con Little Black Bag, una página donde puedes comprar, interacturar e intercambiar con otras fashionistas. Funciona así: eliges un bolso, y luego los estilistas profesionales de LBB escogen 1-3 items...luego si no estas contenta con lo que te eligieron, los puedes intercambiar con otras usuarias. El premio: "Nolita Tote"- valorada en $248. Solo tienes que pasar por AQUI- y ahí podras leer todos los detalles. También queria contarles que desde hoy, 1ero de noviembre, empieza una promoción en la que recibes uno de los 11 productos de Pureology con tu orden- algunos ejemplos de los productos: spray anti-frizz, laca, shampú y acondicionador hidratandote, etc. La rifa termina el 14 de noviembre del 2012, y la ganadora será anunciada en la página de Facebook de Little Black Bag. i'd like to participate too!! i've recently created a blog, so i'd like you to visit it please! What a great bag! LOVE it! What wonderful bag but I´m afraid I can´t participate...Spain is too far. What a great site and giveaway! Thank you!